Sonos and IKEA’s Symfonisk speaker will hit shelves in August | What Hi-Fi? IKEA has revealed in a teaser video that its Symfonisk speaker in collaboration with Sonos will arrive in August. IKEA announced its partnership with Sonos to create ‘future home sound experiences’ at the end of 2017, promising to launch a ‘range’ of products dedicated to integrating music into the home. Last summer, we learnt that the first product would be a wi-fi speaker called Symfonisk (guess which company won the naming honours there…) that can be "integrated with the home furnishing overall" by way of wall brackets allowing you to use the speaker as a shelf. Essentially it’s an on-wall speaker shelf. 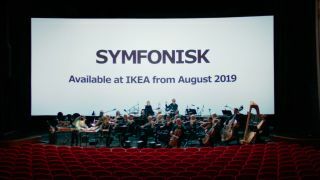 The Symfonisk was demonstrated in prototype form at IKEA’s annual Democratic Design Days conference in Sweden, when it was given an expected release of the second half of 2019. So with new confirmation of an August 2019 on-sale date, we’re glad to see its launch will be punctual. IKEA has been dabbling in smart home products in recent years, having added smart plugs and smart lights to its catalogue. It has just announced that smart blinds are due in April, too. So will the Symfonisk have a voice assistant built in too? Quite possibly. “We for sure wanted this speaker to be a fully-fledged member of the Sonos family without comprises on sound quality and the user experience”, says IKEA Home Smart product developer Stjepan Begic in the video. Begic continues to say that price will be at a “level where we can reach many people”, so we can reasonably expect it to be more affordable than Sonos’ current speaker line-up, which starts at £140.